Left: Michael Johnson obese. Right: Michael Johnson healthy. Clothing cost. I basically had to replace all of the clothes I regularly wear, not just once. My passport photo doesn’t match my face any more, causing delays at border crossings. I don’t get to chug a liter of Cherry Coke every day. I don’t get to binge feast on candy. People who haven’t seen me for a while have trouble recognizing me. When they do, the conversation often turns to weight loss instead of more interesting things. You don’t just passively “lose” weight like you lose a loose object. It takes intentional exercise, consistent self-control with respect to eating habits, and a life-long commitment to maintaining those habits. It takes time and mental energy to stay healthy. Disruptions to routine, such as travel, holidays, etc., can cause past progress to be undone, requiring the same level of effort to re-lose the same weight. I am now negatively buoyant in fresh water if my lungs are not at least half full, meaning it might be easier for me to drown if I get the wind knocked out of me. Therefore, it is more important for me to wear a life vest while boating. I feel better. I have more energy, both physically and mentally. I get more of what matters done, even though I spend more time exercising. The remaining time is more productive. Even the exercise time is not lost, as it is time to think, pray, and listen. I get to enjoy having some newer clothes (even though they are often the same as the old, just newer and smaller). I will soon have a new passport with matching photo and more room for more visa stamps. I am easier to be around, since I feel better about myself, and it is therefore easier for me to be gracious to others. I can do things I couldn’t do before, like routinely run 10 km or more, or bicycle 10 miles up Mount Haleakala then coast 10 miles back down. I will likely live longer, having more time to do what God has put on my heart to do in this world. There is no more need to take any medications to control blood pressure or cholesterol. I have no more trouble with hip joint pain or foot pain. I can sleep well and breathe well at the same time at night without chemical or mechanical aid. I really don’t miss the CPAP machine! I have learned to enjoy healthy food more than I ever enjoyed the junk food I used to eat. I don’t feel deprived, since I never totally cut out any food I like except for most forms of sugar water, and those don’t appeal to me as much as they did since the addiction is broken. I find that I often inspire others to get to a healthier weight. Treat this as a spiritual discipline, a victory of your spirit over your flesh with the help of the Holy Spirit. Pray for help and follow God’s leading. Consume about 500 fewer Calories per day than you burn to lose about a pound a week. (Faster than 2 pounds per week is not very healthy, and less than one pound per week is hard to measure and sustain.) Then don’t consume more than you burn to maintain your target weight once you get there. You aren’t done when you reach your target weight, unless you want to gain back all of that fat again. For me, this requires logging my food and adding up the Calories, which I found not to be as hard as I thought it would be using MyFitnessPal. Note: maintaining that Calorie deficit will result in your feeling hungry from time to time. That is OK. Let your belly be hungry. You won’t die from that level of hunger. Don’t do any fad diets, but stick to sustainable lifestyle changes. What you do to lose weight, you will probably have to do to keep it off. That is why I didn’t totally cut out all desserts, for example, but instead cut back on the frequency and amount of sweets. ALL Calories count pretty much the same in terms of weight loss, but refined sugar is good to avoid, because it doesn’t leave you feeling as full as equivalent Calories from any other source, leaving you hungrier than you should be and eroding your willpower. Make sure you get enough protein, both for muscle building/maintenance and because it helps you feel satisfied. Eat balanced. Eat your vegetables. Have some carbohydrates, but not too much. Fresh, whole fruit is the best way to satisfy a sugar craving. Plan your eating to sustain your health and energy. Stick to it. Sometimes your weight may plateau for a while or even increase a little, but if you keep the downward pressure on with exercise and proper eating, it will eventually go down some more. Expect weight loss rates to slow down the closer you get to your ideal weight, because metabolic efficiency will increase, among other things. This is OK. Just keep being persistent and consistent. Those before and after pictures are not fake. 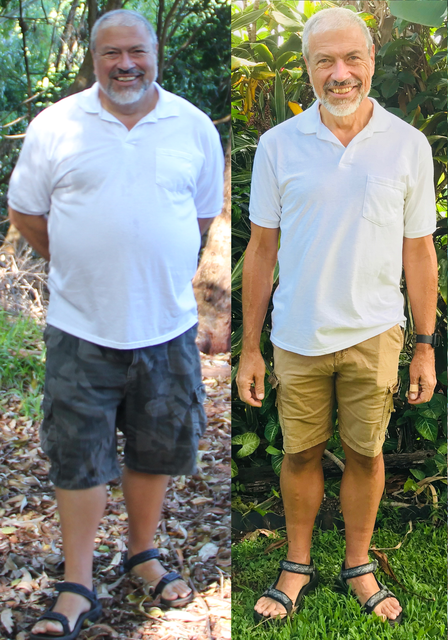 They are both unretouched (except for proportional resizing and cropping) tripod self-portraits of me, before and after losing about 1/3 of my body weight. Left: shirt size XXL and tight around the belly. Right: shirt size M and loose around the belly. I may not look like a professional model, but I feel younger and healthier than I did 2 years ago. Next: What insights have you gained by working on a Bible translation?